In our last International Women’s Day post, we outlined why we celebrate and what International Women’s Day is all about—a global day to celebrate the achievements of women and to continue making the call for gender parity. If we acknowledge the fact that it will take 217 years to reach gender parity, we know that one day of commemoration won’t expedite the process—but International Women’s Day is more than just one day. It is a moment to look back at the progress we have made and be proud of that, then it is time to get to work. 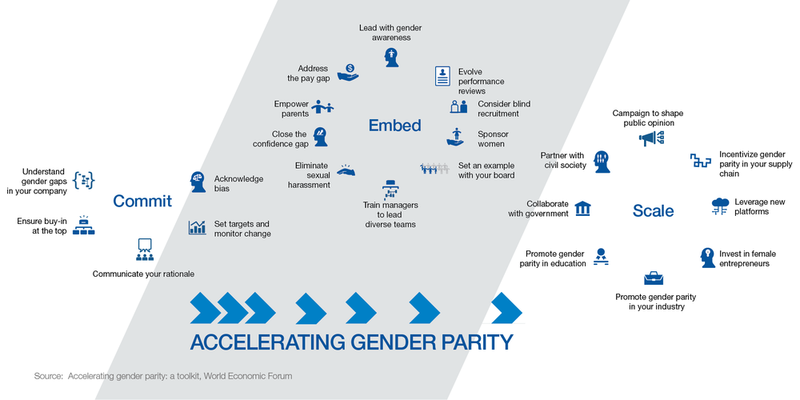 The World Economic Forum has put together a Toolkit for Accelerating Gender Parity with three key stages to acceleration: Commit, Embed, and Scale. As your company makes the call for parity, we recommend taking a look at this toolkit and honestly answering the question, where are we today? Commit: If your organization hasn’t yet acknowledged that gender representation may be skewed in leadership, or that bias might be impacting decisions, start with a bias training for all employees—especially the leaders who need to buy-in to drive change. Embed: If your company has made the commitment to gender diversity, but is struggling with action, start with one thing and grow from there—empower parents through flexible scheduling or evolve performance reviews to be more objective and metrics-based. There are simple ways to get started. Scale: Once you’ve mastered gender parity in your own organization (or are continuing to make progress), it’s time to look outside of the four walls of your company and into the community around you. Through selecting diverse vendors and sharing your success in gender parity with your industry, you can continue accelerating the cause. Okay, okay. So this is what we can make the call for on March 8th, but what can we actually do when we get together? Attend an Event in Your Area: Grab a group of co-workers (women and men!) and head out to an existing event in your area. Look to the listings on the International Women’s Day official site, do a quick Eventbrite search for your location, or reference good ole Facebook to see what’s posted there. Gather Your Office: Coffee and bagels, lunch n’ learn, happy hour—the time of day is flexible! Come together for a screening of a female-focused documentary, put together a panel discussion of leaders in your company to hear how they’ve encountered and approached gender-based challenges in the workplace, or use table topics to prompt discussion among co-workers—the possibilities are endless. Host a Workshop: Gild Collective has created a workshop specifically for this year’s International Women’s Day theme: Press for Progress. We can help your organization at any stage in the process, from first conversation to full-force acceleration. The next best thing? Watch the recording of our Press for Progress webinar! No matter how you choose to acknowledge International Women’s Day in March, remember the two key goals: to celebrate the achievements of women and the progress we’ve made toward parity, and to make the call to continue the drive toward gender parity in the world. Wherever you are today, that is the perfect place to start! Interested in bringinging Gild Collective into your organization? Reach out or sign up for our newsletter.